That was a beautiful photography session with a precious newborn baby girl. The house was full of light and just perfect for lifestyle family images after I finished with the usual posed sleepy shots on blankets and props. Loved every minute of it! Dear clients please don’t forget newborn photography session has to be booked in advance. Ideally you need to book me while you are still pregnant. Sessions will be carried out at your home or my studio. When booking is confirmed I will “pencil” you in my diary and as soon as you’ve had your baby we’ll set up a session date. I have a limited number of newborns a month as they never come on their due date (nearly all have been overdue lately). And keep in mind baby has to be under four weeks. It might not work with older babies, they don’t sleep that well, and I won’t be able to achieve classic sleeping poses that are on my website. So as soon as you had your baby, ideally from hospital text me and we set up a date for your newborn photography session. Be prepared for a long day, typical newborn session takes about 3-4 hours, and I will never rush your baby to perform! Patience and relaxed atmosphere are a key to a successful photo shoot. Images will be a mix of “studio posed shots” with my props – baby only (blankets, baskets, hats, wraps), skin-to-skin parents’ photos with baby undressed (be prepared for “wet accidents”! ), close-ups of baby’s features – tiny hands and feet and followed up by lifestyle candid images of family interacting with the baby, siblings around the house – nursery, living room, shots of all your feet together on a bed etc etc. Feel free to supply me with your own ideas to make the whole experience as personal to you as possible! Here you can read an interview with me http://www.digital-photo-web.com/ann-wo-newborn-baby-photographer.html. This little boy was very easy to settle and his newborn photography session was quick and lots of fun! More photos are coming soon! Beautiful lifestyle newborn photography session at family home in West London. Ann Wo is baby photographer from Berkshire. How lucky I am to be able to play with tiny beautiful babies, working as a newborn photographer in London! This little princess was such a pleasure to photograph. Dear clients please don't forget newborn photographer has to be booked in advance. Ideally you need to book me while you are still pregnant. Sessions will be carried out at your home. When booking is confirmed I will "pencil" you in my diary and as soon as you've had your baby we'll set up a session date. I have a limited number of newborns a month as they never come on their due date (nearly all have been overdue lately). And keep in mind baby has to be under three weeks. It might not work with older babies, they don't sleep that well, and I won't be able to achieve classic sleeping poses that are on my website. So as soon as you had your baby, ideally from hospital text me and we set up a date for your newborn photography session. Be prepared for a long day, typical newborn session takes about 4 hours, and I will never rush your baby to perform! Patience and relaxed atmosphere are a key to a successful photoshoot. Images will be a mix of "studio posed shots" with my props - baby only (blankets, baskets, hats, wraps), skin-to-skin photos with baby undressed (be prepared for "wet accidents"! ), close-ups of baby's features - tiny hands and feet and followed up by lifestyle candid images of family interacting with the baby, siblings around the house - nursery, living room, shots of all your feet together on a bed etc etc. Feel free to supply me with your own ideas to make the whole experience as personal to you as possible!. I have more recent work on my newborn photography Facebook Page https://www.facebook.com/AnnWoPhotography Go ahead and press Like so you'll get recent news and see new photos. 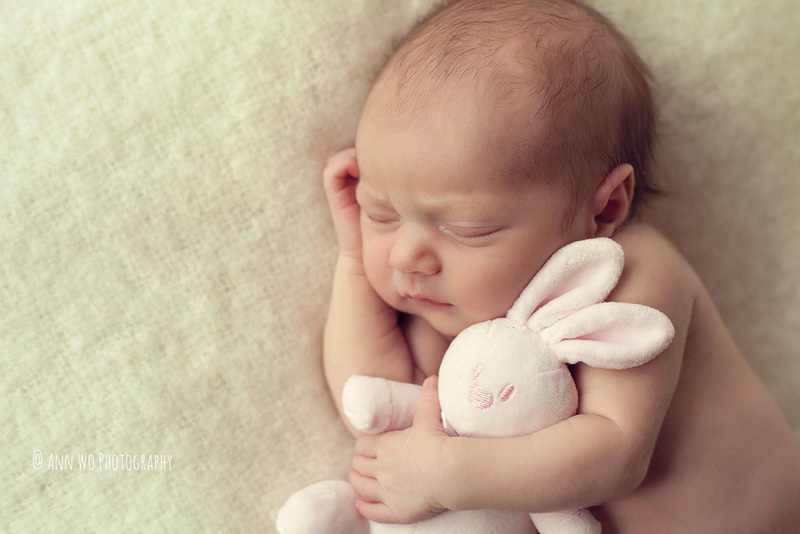 Newborn photography prices are here.